Mitsubishi Motors President Tetsuro Aikawa (right) and Executive Vice President Ryugo Nakao leave a news conference at Japan's transport ministry in Tokyo today. TOKYO -- Mitsubishi Motors Corp. said it has improperly tested the fuel economy of its cars for the past quarter century, deepening a crisis that’s already wiped out half its market value. The automaker formed a panel of three former prosecutors to investigate improper testing that goes back as far back as 1991, including the falsification of fuel efficiency data, according to a statement today. The company said last week it had not been complying with Japanese testing standards since 2002. "Customers bought our cars based on incorrect fuel-economy data," President Tetsuro Aikawa told reporters during a press conference today. "I can’t help but apologize." The revelation reignited concerns about Mitsubishi Motors’ viability and sent shares plunging for a fifth day, dropping the company’s market value to 427 billion yen ($3.85 billion). Wrongdoing by the Japanese automaker and Volkswagen Group has prompted rising scrutiny of the way carmakers test for and label the fuel economy and exhaust emissions of their vehicles. Mitsubishi Motors hasn’t decided on how it will compensate customers, said Aikawa, who also told reporters he wasn’t aware of the improper testing. 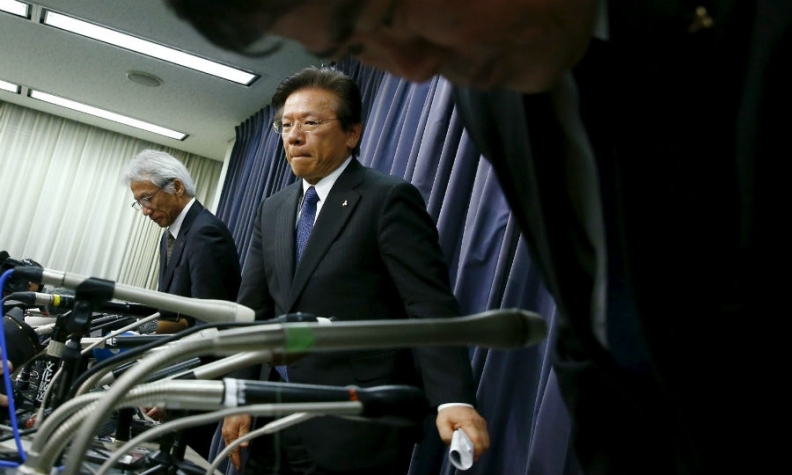 Aikawa, 62, and other executives attended meetings where the company raised fuel economy targets for minicar models that the company said last week had been rated with manipulated data, Ryugo Nakao, executive vice president, told reporters today in Tokyo. Mitsubishi Motors doesn’t know how many models have been tested improperly since 1991, Nakao said. When initially disclosing the misconduct last week, the carmaker said the fuel efficiency of 625,000 minicars had been exaggerated by as much as 10 percent. Three-quarters of the vehicles rated with deliberate use of false data were supplied to Nissan Motor Co. as the Dayz and Dayz Roox models. Nissan first uncovered discrepancies when working on development for the next generation of the minicars, which Mitsubishi Motors sells as the eK Wagon and eK space. Mitsubishi Motors still plans to report fourth-quarter results on Wednesday, Nakao said. The company probably will say quarterly net income increased 32 percent to 25.9 billion yen, according to analyst estimates compiled by Bloomberg. Japan’s government is forming a task force to take steps that would prevent irregularities in vehicle testing, Transport Minister Keiichi Ishii told reporters after a cabinet meeting Tuesday in Tokyo. Manipulation of fuel-efficiency tests is “extremely serious,” he said. Mitsubishi Motors may have to pay back government tax rebates its minicars shouldn’t have been eligible for, Nakao said last week. The company is in discussions with Nissan on a plan for compensation Nissan customers, Aikawa said. Government investigators last week raided French manufacturer PSA Group as part of broader checks into vehicle emissions, while Daimler said it initiated an internal probe into its certification process at the behest of the U.S. Department of Justice.